Ten minutes from my house, in downtown Edmonds, you’ll find a shop called Otherworlds. It’s filled with sci-fi and fantasy books, role-playing games, fan merch from Firefly and Buffy and Doctor Who, birthday cards printed with the Indiana Jones font that say “You belong in a museum!“, geek gadgetry and trinkets, and — most interesting of all — steampunk costumes. And not the cheap stuff. We’re talking elaborate, high-quality masks and hats and jackets and shoes and fake weapons (like vampire stakes) and accessories — and enough fancy spectacles and goggles to fill a Guillermo Del Toro movie. It’s extravagant fantasy dress-up for people who have big budgets for costume parties. I love this stuff. I wish I could afford some of those hats. You get the feeling that putting one on will automatically transform everything around you. 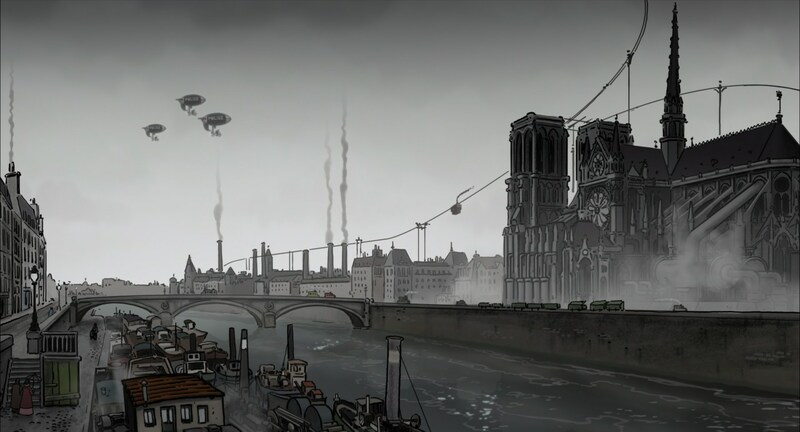 There’s something about this imaginary world, this alternate history where computers and electricity never took over civilization, where people travel by zeppelin, where ground transportation is powered by steam, that re-enchants the world. So why is it that, whenever I ask for recommendations of the great steampunk fantasy novels, the answer is almost always heavily qualified? “Well… there are good steampunk books. But the great one is yet to be written.” I’ve heard that more than once. Occasionally, someone will make an argument that Cherie Priest is the best steampunk author out there, but no, not the one that all steampunk fans have been waiting for. That always raises another question. What’s the great steam-punk movie? There aren’t many contenders. The Golden Compass? Good steampunk elements, lame movie. The closest thing to a great one that I’ve seen so far is Sky Captain and the World of Tomorrow. I had high hopes for April and the Extraordinary World, even though the American-release title sounds more than a little desperate to get our attention. 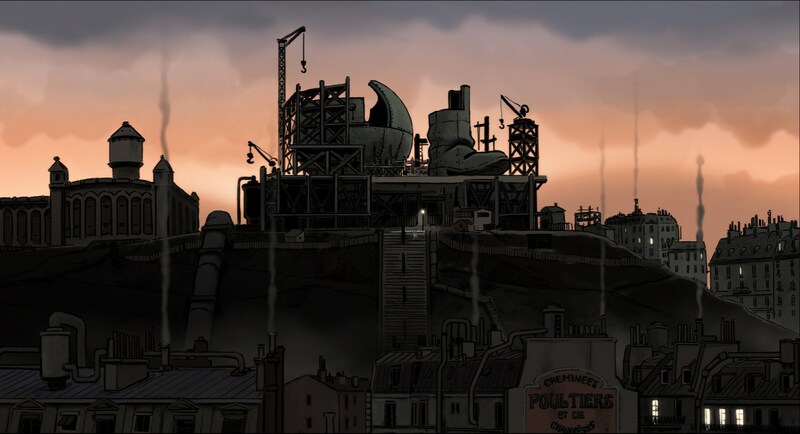 It turns out that this French animated epic, directed by Christian Desmares and Franck Ekinci, and spun from the imaginative loom of French graphic novelist Tardi, delivers on the title: It’s about a young woman named April… and she’s having adventures in a world that is truly extraordinary: one clouded with coal pollution, grim with post-war ruins, and alive with robots and strange modes of transportation. But the problem is that April’s world is so extraordinary that neither the characters nor the story itself every really amount to much. It strikes me a film in which the artists were so caught up in the wild possibilities of their alternate history that they couldn’t bring themselves to spend much time thinking beyond the story’s rather perfunctory treatment of questions about science and responsibility. April, of course, gets away with her talking cat Darwin (another triumph of science) and, though they don’t know it yet, what may well be the cure-all potion. 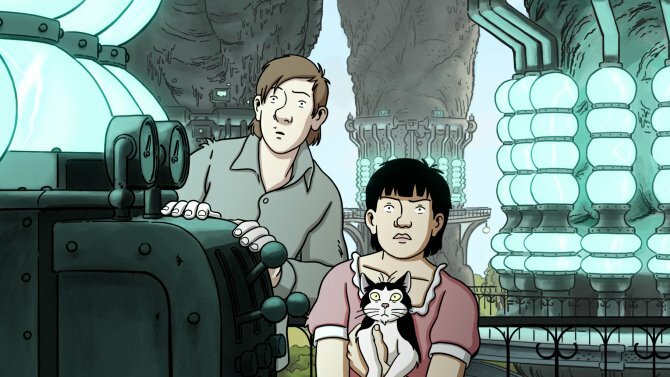 And the film’s simple storyline is pretty much determined: She (voiced unremarkably by Marion Cotillard) and Darwin (by Philippe Katerine) will have adventure after adventure dodging the bad guys, trying to recreate the serum before age and illness end the cat’s life. That timid young miscreant in the shadows will, of course, go from spying on April to falling for her. And everything will eventually come full circle to… well, that would be telling. Let’s just say that it involves a rocketship, reptiles in robot suits, and an Edenic wonderland where what’s left of earth’s natural beauty clings to life. Perhaps steam-punk enthusiasts will find this satisfying. (Film critic Glenn Kenny was certainly enthralled.) And sure, details like this world’s double Eiffel Towers, the spectacular cable car lines, the sinister dark clouds sparking with lightning are occasionally awe-inspiring. But the Keystone Cops klutziness of the police who pursue April rarely registers as funny. The constant shoot-outs, chases, explosions, Transformer-like shape-shifting of vehicles and buildings — all of this makes things too clamorous, and the escapes are always so outrageous that no one is likely to feel anything like suspense. In the constant calamity, I never quite get attached to the characters (with the exception of Darwin the Cat, who is a one-of-a-kind animated character from his whiskers right down to his cartoon testicles). By the time the film finally brings the heroes face to face with the villains, these two hours are beginning to feel more like three. What’s it all really about? This “extraordinary world” (a more accurate translation is “twisted world,” but that might not have sold tickets in America) is suffering from severe pollution and environmental devastation due to its dependence on charcoal — merely an exaggeration and a dry satirization of our own self-destructive addiction to oil. But the film has no real insights to offer, just a murmur of melancholy bordering on despair. April’s bravery will lead to a blandly explosive conclusion, and it will all conclude on an artfully poignant note. But for my money, the period-detail exaggerations of Guy Ritchie’s Sherlock Holmes movies get me closer to the right balance of storytelling and world-building that would make up the steampunk movie of my dreams. And as tributes to Tardi go, the comic-book glories of Luc Besson’s The Extraordinary Adventures of Adèle Blanc-Sec — a live-action fantasy adventure that might have been a surprise hit in America if it had been given a good marketing push — remains the most rewarding. So, here’s an opportunity, artists: Steampunk is a wildly popular genre that is still waiting for both a defining novel and a defining movie. For me, that most satisfying steampunk experience remains that curious costume shop, which if filled with artifacts from an otherworldly experience, silent and suggestive, filling my head with stories of my own. For great steampunk novels, I recommend “The Foundling’s Tale” series by D.M. Cornish. It’s called the “Monster Blood Tattoo” series where it was first released: Australia. In the series, monster-hunting is a popular and dangerous profession. Hunters mark themselves with the blood of monsters they kill. The series is about a foundling (orphan) who is constricted into the military. The first book is about his journey from the orphanage to the fort where he will begin his profession. Could Miyazaki’s Castle In the Sky count as steam punk? It has a setting vaguely similar to that of of 17th or 18th century Europe, but it also has exotic aircraft and technology even excluding the technology of the titular castle which is meant to be more advanced in the setting of the film. The film could take place in an alternate past or a distant future but it contains all of the retro-futuristic trappings of the steam-punk genre. It has also been critically acclaimed so it would fill the criteria of being a good movie, if not a great one, in the steam-punk genre. Ooh, that’s a very good nomination for Best Steampunk Movie. If steampunk purists consent, this might be the grand prize winner. I would consent! – I clicked on the comments thinking to nominate Laputa for it myself. On another medium, have you seen the comic series Girl Genius by Phil and Kaja Folio? I found it’s “ACT I” enjoyable for the growth of its protagonist on the one hand and its worldbuilding and occasional history jokes on the other. I hear there are novel adaptations, but don’t know if they are any good. Finally a review that reflects my experience with the film. It didn’t help that I accidentally saw this with the English dub, which is (I hope) broadly translated and often gratingly performed.. Few of the effusive critical raves acknowledge that there is a great deal of attempted humor here, little of which landed for me (or the dead silent audience I watched this with), and I had the same thought as you about this feeling like an enervating Saturday morning cartoon with its endless series of at-best passably engaging chase sequences stitching together a narrative that is strangely predictable for how thankfully outlandish it becomes. You should change this to a negative review on the aggregate sites, it reads as one, and the film deserves a little less uncritical acclaim. Dreams come true. Be a part of one.